NEW DELHI: India is now swiftly moving towards acquiring five advanced S-400 Triumf air defence missile systems from Russia despite the looming threat of US sanctions, with the defence ministry clearing the decks for the proposed Rs 39,000 crore deal. 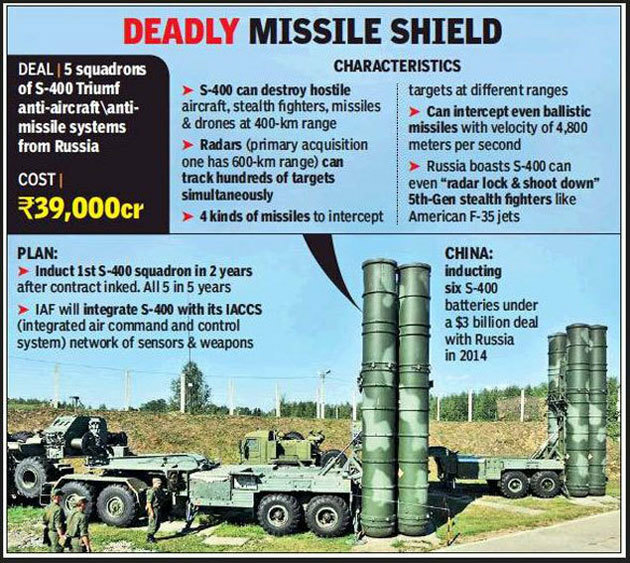 Top sources say the defence acquisitions council (DAC), chaired by minister Nirmala Sitharaman, on Thursday, approved the “minor deviations” in the mega S-400 deal that had emerged during the recently-concluded commercial negotiations with Russia. “The S-400 procurement case will now go to the finance ministry for clearance and the PM-led Cabinet Committee on Security for the final nod. The country’s top political leadership will have to take a call on when the actual contract can be inked,” said a source. The DAC was held just a day after the US on Wednesday night once again cancelled the inaugural “two-plus-two” dialogue between foreign minister Sushma Swaraj and defence minister Sitharaman with their American counterparts— Mike Pompeo and Jim Mattis— which was slated for July 6 in Washington. TOI was the first to report in October 2015 that India had kicked off plans to acquire the S-400 missile systems, which can detect, track and destroy hostile strategic bombers, stealth fighters, spy planes, missiles and drones at a range of up to 400 km and altitude of 30 km, in what was being touted as a game-changing military acquisition. Subsequently, the inter-governmental agreement for the five S-400 systems was inked during the Modi-Putin summit at Goa in October 2016. Even as India and Russia were putting the finishing touches on the complex S-400 contract ahead of the next Modi-Putin summit in October this year, Washington jumped into the fray to warn New Delhi against going ahead with the deal. India and Russia have worked on a roadmap to get around the financial sanctions flowing out of the recent US law called CAATSA (Countering America’s Adversaries through Sanctions Act) that seeks to deter countries from buying Russian weapons. Under the proposed S-400 deal, the IAF will get the first S-400 squadron, with its battle-management system of command posts and launchers, acquisition and engagement radars, and all-terrain transporter-erector-launcher vehicles, 24 months after the final contract is inked. All the five squadrons, with two firing units each, will come in 60 months.